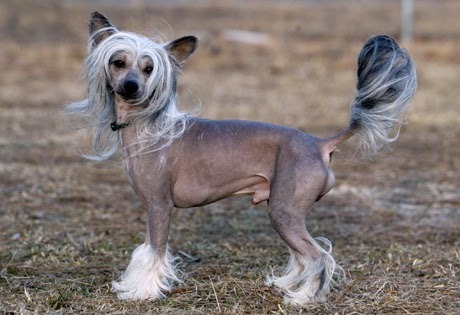 The Chinese Crested has become the most popular dog amongst the hairless breeds, but it is still considered rare. They allegedly accompanied Chinese sailors, hunting vermin, and can still be found in port cities all around the world. The Chinese Crested are believed to have evolved from African hairless dogs, and the Chinese selectively bred them to a smaller size. They appear in history as early as the 1500s and explorers encountered them in Central and South America as well as Africa and Asia. Since they don't have the coat of a "regular" breed, Chinese Crested are more prone to allergies and sunburn than most other dogs. There is actually a variety covered with a double, soft, straight coat called a Powderpuff, and the two types often come from the same litter, but the Powderpuff is genetically recessive. Most Chinese Crested are very gentle with children, but parents should consider that these dogs don't have a protective coat and get injured easily, so the children must be taught to return the gentleness. These dogs are alert, charming, agile, and affectionate. They are also intelligent and good at performing tricks. They do not like to be alone, and they need to be a part of the family. I used to think that these were the ugliest dogs, but today, I just love them. They are so unique and have a beauty all their own. I have a friend from FB that lives in the Twin Cities that is a Crested. We have met up a couple times also with other ones. They are super fun and funny! Hard to imagine them living in frozen MN, but they do just fine with their clothes.